Due to a conversation I JUST HAD yesterday with some girlies about accessorizing, I am reposting this little ditty from a while ago. 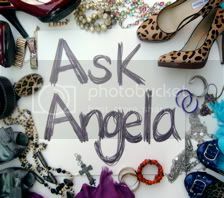 Because, so many people are stuck in a rut with their accessories... or simply afraid of them altogether. In my opinion, the best thing to do is just dive in head first and make sure you get the honest opinion of a few fashion-wise girlfriends (keywords: honest opinion, fashion-wise). But, not all are of that mindset, so here is a tried and true way to start a little slower. I hear all the time, "But, how DO you accessorize?" "How do you know?" "Where do you even start?" "I wouldn't know what to buy!" "I'm not sure, so I just wear the same studs all the time." "I just forget the jewelry altogether. I mean, who has time?" I will address other accessory issues in other posts, but I want to start you off with a simple, simple philosophy: everything looks better with hoops and a bracelet. Everything. This isn't to mean these are the only accessories in your repertoire, but it's a darn good place to start. I race around just as much as anyone, and 80% of the time I'm not going to go through my jewelry box trying on different things to see what looks perfectly right. But I do have a few different sizes of hoops and a couple different bracelets I can throw on as I'm slipping my feet into my shoes. It takes nothing extra, but adds so much. A good rule of thumb is to have small, medium, and large hoops in both gold and silver (I only have medium and large in silver, though.) If I'm in my velour pants and hoodie, I go with smaller earrings and a smaller bracelet. If I'm in heels, the larger earrings and chunky cuff. (Unless I'm wearing a chunky necklace, then I stick to the smaller ones so it's not visually too much.) Make sense? It's really not an overwhelming thing, and you get the hang of it so easily. Plus, hoops look super cute when worn with a hat. (Hats. Yay! We'll address that in another post, too.) They just add that something extra you were thinking your outfit needed, but didn't want to take the time to figure out. "But, Angela! I don't want to run out and spend a bunch of money on six new sets of earrings and four new bracelets!" You don't HAVE to!!! Go look in your jewelry box right now. I know you have some bracelets shoved in the back. You don't have to stick with gold or silver, either! I'm just giving you a simple little philosophy that will make things easier. Expand on it!!! Be creative! If you have a bunch of little bracelets, pile them on together for a chunky look! The next time you're at Ross or TJ's pick up one of those three packs of hoops for a few dollars. You can even spend that extra four bucks on the funky cuff you passed on before because you didn't know what to wear it with. Then on Monday when you're heading out to run errands, throw the medium sized hoops on with your jeans and tee. Slip on that funky cuff. Look in the mirror and you'll see what I mean. You'll initially feel like it's too much... but it's not. You'll feel a little cuter, a little more fun, and there will be an extra spring in your step. Now it's easy. You'll have your fall back accessories for any outfit, and the guesswork is gone! Side note: For those of you who have questions, just click that little Ask Angela button over there in the top right corner and ask away! It doesn't even have to be a fashion question, although those are so much fun. Thanks for stopping by Fashion Tip Friday!